1. In a large bowl, place clams with water and salt. Cover and set aside for several hours or overnight. (This will allow the clams to expel sand). 1. In a wok, melt butter then saute ginger, garlic and onion until translucent. 2. Add tomatoes then continue sauteing for 3 minutes. 3. 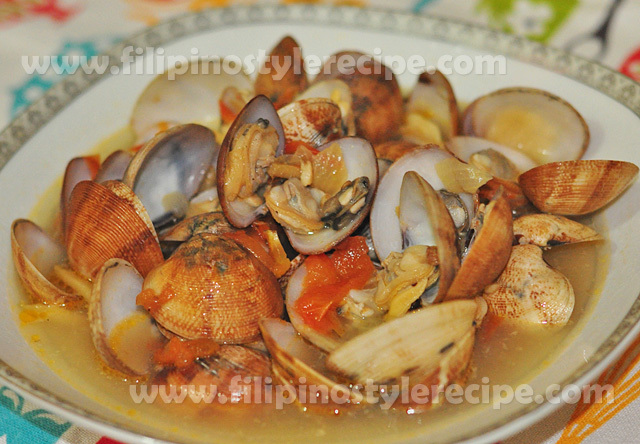 Add fish sauce and the clams then saute for another 2 minutes. 4. Pour water then cover and let boil. Adjust seasoning with salt and ground pepper. 5. Continue cooking over a high heat until clams open. 6. Transfer to serving bowl then serve with steamed rice.